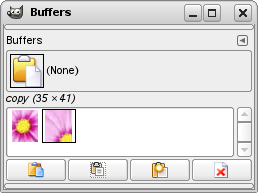 Buffers are temporary repositories for image data, created when you cut or copy part of a drawable (a layer, layer mask, etc.). You can save a document in this buffer in two ways: Edit → Buffer → Copy Named or Edit → Buffer → Cut Named A dialog pops up asking you to name a buffer to store the data in. There is no hard limit on the number of named buffers you can create, although, of course, each one consumes a share of memory. The “Buffers” dialog shows you the contents of all existing named buffers, and allows you to operate on them in several ways. It also shows you, at the top, the contents of the Global Buffer, but this is merely a display: you can't do anything with it. Named buffers are not saved across sessions. The only way to save their contents is to paste them into images. This dialog is a dockable dialog; see the section Paragraaf 2.3, “Koppelen van dialoogvensters” for help on manipulating it. from the Tab menu in any dockable dialog by clicking on and selecting Add Tab → Buffers. In the Windows menu, there is a list of detached windows which exists only if at least one dialog remains open. 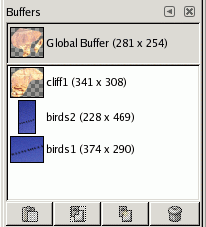 In this case, you can raise the “Buffers” dialog from the image-menu: Windows → Buffers. Clicking on a buffer in the display area makes it the active buffer, i. e., the one that will be used for paste commands executed with the Buffers Menu or the buttons at the bottom of the dialog. Double-clicking on a buffer causes its contents to be pasted to the active image as a floating selection; this is a quick way of executing the “Paste Buffer” command. At the bottom of the dialog are four buttons. The operations they perform can also be accessed from the Buffers Menu that you get by right clicking on the active buffer. In the Tab menu for the “Buffers” dialog, you can choose between View as Grid and View as List. In Grid mode, the buffers are laid out in a rectangular array. In List mode, they are lined up vertically, with each row showing a thumbnail of the contents of the buffer, its name, and its pixel dimensions. You can change the size of the buffer previews in the dialog using the “Preview Size” submenu of the dialog's Tab menu. This command pastes the contents of the selected buffer into the active image, as a floating selection. The only difference between this and the ordinary Paste command is that it uses the selected buffer rather than the global clipboard buffer. This command deletes the selected named buffer, no questions asked. You cannot delete the Global Buffer. These commands are explained above with Buttons.